The Subscription Management Addon gives your contacts the ability to manage their email subscription preferences. When the feature is enabled, all email newsletters will include a Preferences link along with the normal unsubscribe link. 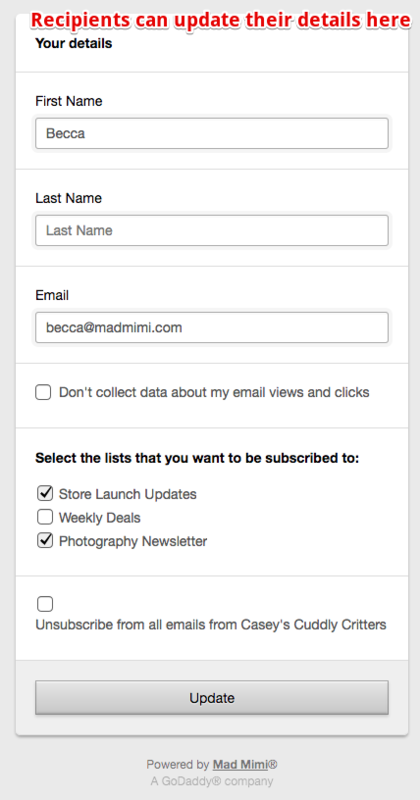 With the Preferences link, your readers can update info like email address, name and list subscriptions. They can also disable the ability to track their Views and Clicks (a privacy feature required by GDPR regulations). You’ll always have total control over which lists are available for subscription management, too! Click on Add Things at the top of any page. Select any list on the right to include it in the subscription management options. All active Subscription Management lists will appear on the left. Once a list is selected, you can edit the Public Name your readers see. You can also delete a list from the Subscription Management choices at any time. Once they click “Preferences,’ readers will receive an email with a link to their preferences page, where they can see all the details available for management. First Name, Last Name, Email address, data tracking, and list subscriptions can be updated by readers at any time. Use the Promotion Tweaks option to change the location of your Manage Subscription Preferences link. You can place it at the top of your email newsletter, in the footer, or in both spots!